Charles Richard Harris, 90, passed away Monday April 15, 2019. Born March 9, 1929 in Nashville, TN, he was the son of the late Harvey M. Harris and Nora O. (Walker) Harris. Charles was also preceded in death by his wife, Sylvia Gayle (Culbreath) Harris; and his four siblings, William Harris, Sally Smith, Filmore Harris and Herschel Harris. 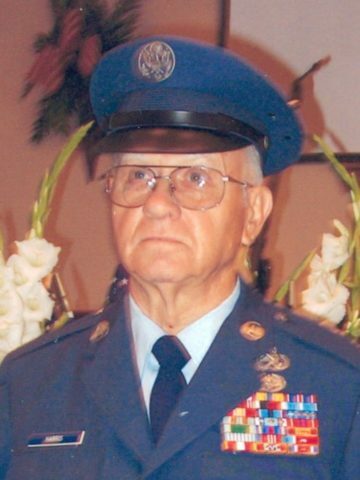 Charles retired as a Senior Master Sergeant in the TN Air Guard after 38 years of military service to his country, both active and reserve, and was a Korean War Veteran of the US Army where he served as a front line medic. Charles was also a member of Goodlettsville Lodge of Masons and a 32nd degree member of all Scottish Rite Bodies. He was a devoted husband, father, grandfather, great-grandfather and great-great-grandfather. Always helping others where he could he had delivered “meals on wheels”, participated in Habitat for Humanity Projects and made several trips to Florida following storms there to assist in the clean up and rebuilding efforts. He was a member of the First Baptist Church, Goodlettsville and loved being in the Senior Choir. Charles was deeply rooted in Goodlettsville and the surrounding area. In his spare time he loved camping, working in the yard, farming and traveling. He is survived by his children; Richard W. (Cheryl) Harris, Elaine Harris (Larry) Buckner, Cynthia Harris (Steve) Wilson, and Bonnie Catherine (Derek) Latta; 9 grandchildren, Shannon, Chrissy, Rachiel, Walter, Joe, Charles, Owen, Aidan and Madeline; 10 great-grandchildren; 4 great-great-grandchildren; extended family and numerous friends. A Life Celebration Service for Charles will be held Friday at 11 AM at Cole & Garrett Funeral Home Goodlettsville followed by interment with full military honors at Forest Lawn Cemetery. Visitation will be held at the funeral home Thursday from 4 – 8 PM and Friday from 9 – 11 AM. A Masonic Evergreen Service will be held during the visitation. THANK YOU AND ALL THE HARRIS FAMILY DID FOR MY FAMILY WHEN WE LIVED IN TENNESSEE BEFORE MOVING TO TEXAS IT WAS A SURE BLESSING FOR THE SUPORT YOU GAVE TO US/.